The Williamsburg Farmers Market is an open-air market located in Merchants Square on Duke of Gloucester Street in the heart of historic Williamsburg, Virginia. The market has over 35 vendors offering a variety of local produce and products including mushrooms, berries, free-range chickens, pasture-raised meats including bison, beef and pork, seafood, eggs, cheese, organic vegetables and fruit, greens, herbs, cut and potted flowers, gardens, plants, spice rubs, peanuts, honey, jams and butters, homemade baked goods, confections, goats milk soap, handmade decor and more. The market also has Music and Chef Demonstrations. Open Saturdays, April-October 8 am - 12 pm. Check website for winter and holiday market schedule or call 757-259-3768. 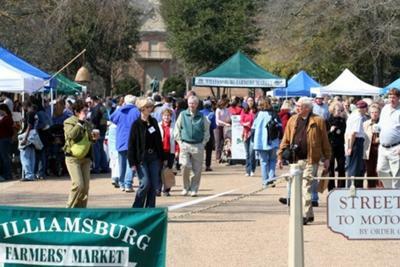 The Williamsburg Farmers Market is located in Merchants Square in the heart of historic Williamsburg, Virginia. Flowerbeds and benches offer a tranquil setting for this open-air, Virginia producer-only market. Over 35 vendors offer a variety of local products, among which are fresh seasonal produce, free-range chickens, beef, bison, pork, oysters, fish, crabs, prawns, herbs, potted plants, baked goods, confections, honey, cheese, mushrooms, cut flowers, handmade soaps, and more. Enjoy chef demonstrations, listen to live music, and learn while you shop. February 9 and March 9 8:30 am -12:30 pm and Saturdays, March 30 - October 26, 8am - 12pm with Holiday markets November 23, 30 and December 14. See website for dates and vendor information. Free parking available. In 2009, the Williamsburg Farmers Market was voted "America's Favorite Farmers Market" in the mid-sized category in the American Farmland Trust contest. The market is working in 2010 to retain this title. Please cast your vote for The Williamsburg Farmers Market at www.farmland.org/vote and help your Williamsburg Farmers Market reach their goal of 1000 votes.